Bruce Pascoe's remarkable 2014 account of how Aboriginal Australia, upon first contact, had a sedentary agricultural economy, even in what is now referred to as the “dead centre” of the country, is a lesson in how non-Aboriginal Australians have forgotten our shared history. Pascoe reviewed the journals and diaries of early Europeanexplorers and settlers to build his case and supported it with studies undertaken by colonial and post-colonial non-Aboriginal researchers. The first question that formed in my mind as I read Dark Emu, Black Seeds: agriculture or accident? was how we could have collectively forgotten this shared history? After 35 years of teaching in two states and the Northern Territory with my wife, my hypothesis is that generation after generation simply chose to forget and that this generation is in danger of repeating history. Like the history of the frontier wars, we have a collective blind spot about how non-Aboriginal Australians view Aboriginal peoples. It goes to the history of dispossession, terra nullius and all that stuff we have buried probably under two centuries of guilt. In the 1990s, former prime minister John Howard did Australia a huge disservice when he politicised and gave credence to one man's views, Geoffrey Blainey's “black armband theory of history”. This blind spot interpretation of our shared Australian history was the clarion call for conservative-minded Australians, including Aboriginal Australians, to look elsewhere for solutions to the “Aboriginal problem” up until the present day. In school education for example, eminent Aboriginal Australian leaders advocated for importing a US-based, developed and owned teaching package known and copyrighted as “Direct Instruction” with ongoing disastrous results in the Gulf Country and elsewhere. Talk about dispossessing young Aboriginal Australians in a mistaken belief that even “failing students” and “failing schools” can learn; the problem paradigm once again imposing a “solution”. Of course Aboriginal students can learn! If I have learnt nothing else as a teacher, I hold as a universal truth that teaching is far more complex than reading a prescribed script to creative young minds. It is, in fact, the remarkable resilience of our First Australians, their respect for their elders and their tenacious fight to remain connected to country, culture and history that has allowed modern Australians the opportunity to relearn our national history through voices such as Bruce Pascoe's. Pure and simple, Dark Emu, Black Seeds confirms our need, as a nation, to listen to Aboriginal and Torres Strait Islander voices. The First Peoples do have the answers, not just for themselves but for all of us, to grappling with the effects of a changing climate and the balance between the need for sustainable resources management and the needs of the modern world. Rather than Aboriginal Australia being viewed as a problem for politicians and policy makers, we need to listen and learn if we are ever going to Close The Gap. 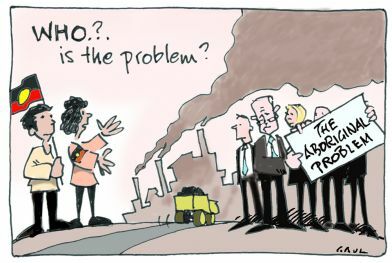 As activist and politician Rosalie Kunoth-Monks put so eloquently and movingly on the ABC's Q&A in June 2014: "I am not the problem." Governments need to stop intervening and listen, genuinely listen, by providing the policy platform to enable the gap to be closed. The Uluru Statement from the Heart in 2017 was a missed opportunity and treated with disrespect by the Turnbull Government. Earlier, in February 2017, the National Congress of Australia's First People delivered The Redfern Statement to the Prime Minister in Canberra. Its message – “We have the solutions” – was an appeal to listen to the elected voice of Aboriginal and Torres Strait Islanders. Again, politicians chose not to listen. Unfortunately for modern Australia, we cannot seem to shake our blind spot even when we are failing to reach most of the so-called Close the Gap targets. I urge the federal and state governments (COAG), unions and industry groups to stop trying to shape policy from a failed paradigm and have the courage to establish genuine listening protocols and systems to give voice to a remarkable collection of First Peoples’ nations. The opportunity exists now, unless we wish to once again ignore all the positive stories and solutions that Aboriginal and Torres Strait Islanders have to offer. Why is it that Australian governments can follow well-established diplomatic protocols when dealing with foreign states but not when dealing with its own Indigenous peoples? Why are international trading agreements negotiated for years (behind closed doors) and we cannot offer that process and protocol to our First Nations? There it is; the blind spot. The truth is that we cannot do worse than we have thus far. More money isn't the answer; resources for Respect and Reconciliation are. We could learn from Nelson Mandela and establish a Truth and Reconciliation Commission. I am aware that some First Peoples argue that they do not even get a voice in the National Congress of Australia's First People forum. If that is indeed the case, a Truth and Reconciliation Commission should address that. The only question has to be: Can government and business find the courage to establish a Truth and Reconciliation Commission instead of trolling their vested ideas and policies by continually blaming the dispossessed? Similarly, can unions and other advocacy groups find the courage to take up the challenge to advocate for our Indigenous peoples as having the solutions rather than perceiving them as a disadvantaged group to advocate on their behalf? Australia needs to heal a two-century-old wound in order to become a courageous and truly fair country. Without a genuine healing process, good luck with Closing the Gap. Have courage. Act courageously. Give courage. Let's truly be a country of the dinkum fair go. — Philip von Schoenberg teaches at Port Macquarie Public School and is a member of Federation's Executive.